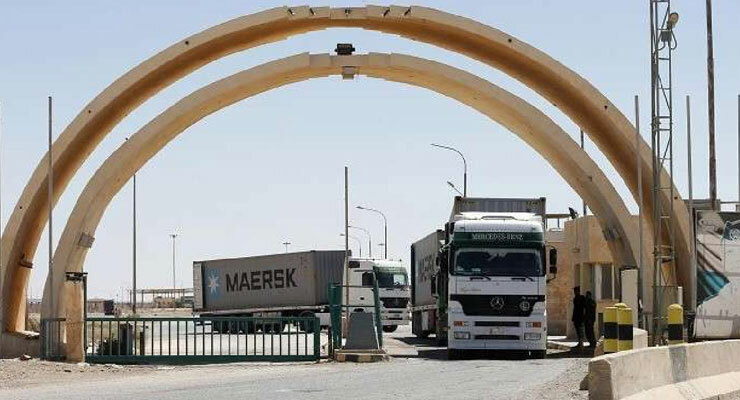 Exporters will be able to resume distribution of agricultural and industrial goods through the Nassib crossing border, between Syria and Jordan. The crossing was reopened after being closed for three years due to turmoil in Syria. The closure of the Nassib border crossing in 2015 cut off a vital access point to Jordan and Gulf markets. “There are no decisions that ban the export of local goods through Nassib border, but the process requires time and more organization,” said Dany Gedeon, Director General of the Ministry of Industry. Ibrahim Tarchichi, Chairman of the Association of Bekaa Farmers, said exporters can start today to load their trucks to export their goods to Jordan and Gulf markets. Agriculture trucks coming from Jordan will also be able to cross borders and enter the local market, Tarchichi said. “This will save time and money for farmers,” Tarchichi said. Trucks that used to take 20 days for transportation through sea will reach Jordan in two days. Farmers used to pay $8,000 per truck exported through Roll on Roll off boats (RoRo). Overland costs will not exceed $2,000. The government, through IDAL, was subsidizing $3,000 for each truck exported on RoRo. “Around 55 percent of industrial goods and 75 percent of the agricultural products used to be exported via land through Syria,” said Mounir Bissat, Head of the Council for Industrial Exports’ Development at the Association of Industrialists. “Agricultural exporters will benefit more than industrialists, because industrialists were not bearing additional transport costs through the sea,” said Bissat.